Basically I want to convert a normal bike to a nice electric one, and aim to find the cheapest/easiest/most current way to do so. Not much in the case of innovation, but a fun project and something not many people consider to be an option. I proclaim this project done \o Ended up using a couple RC batteries in series, so i could keep using my old charger etc. Woop, motorkit and batteries arrived \o/. Dropped of bicycle & motor at local bikeshop for them to respoke the wheel with motor inside. Hopefully done in ~2 weeks. Meanwhile i'll wait for BMS before starting to make a batterypack. Ordered a 10S BMS to make my own battery. 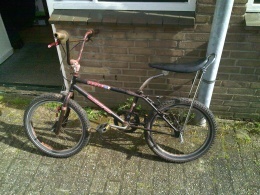 Scored a free BMX to start, and looking at (cheap chinese) parts to order.